This was for my post 911? BlogAdda has started 'Tangy Tuesdays' and 'Spicy Saturdays' where BlogAdda picks up good posts from Indian blogosphere and serves it to the readers on tuesdays and saturdays. This way, good posts are acknowledged and readers get to read quality content. I am so glad that my post was selected. 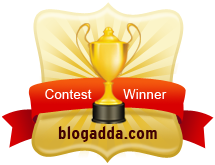 Thanks to Blogadda for choosing me(ear to ear grin).